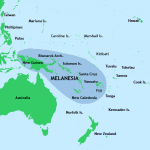 Organisations and politicians from the US, Asia and the Pacific have written to leaders of the Melanesian Spearhead Group, calling for sustained efforts to give Papuans a voice and welcoming MSG leadership on the issue. The MSG, currently under the chairmanship of New Caledonia, is considering a Papuan application to join the Group. Paul Barber, coordinator of the UK-based organisation TAPOL, a human rights body focussing on Indonesia, says 98 international organisations and NGOs have written to the MSG. Speaker: Paul Barber, coordinator, TAPOL. BARBER: This is a letter which has been written by 98 international organisations, written to the leaders of the Melanesian Spearhead Group, supporting West Papua's formal application for membership of the group, but also in solidarity with the thousands of West Papuans who've demonstrated over the past year, calling support from their Melanesian neighbours to acknowledge their suffering and to have their Melanesian identity recognised through being granted membership of the group. This is a range of signatories from around the world, including Pacific island countries, Fiji, New Zealand, Australia, regional signatories in Thailand and the Philippines, as well as the USA and the UK. LAM: This group has applauded the MSG's efforts for showing leadership on the rights of Papuans, but is the message being heard in Indonesia - particularly, the TNI, the Indonesian military, which of course has a heavy presence in the province? BARBER: Yes, well, we hope so, and you're right to say that the MSG has taken leadership on this issue, and we particularly welcome the fact that Vanuatu for example, has spoken out about human rights violations in West Papua at the UN General Assembly and called for the UN to appoint a special representative to investigate. We hope that this will lead to increased attention to the human rights situation in West Papua, and perhaps even more accountability of the TNI. LAM: The letter, I understand also made mention of the Melanesian population in Papua province itself, that it seems to be dwindling - what evidence is there to support this? BARBER: Well, it is a fact that the Papuan population of West Papua is becoming increasingly marginalised, as a result of a process of migration, which is happening from other parts of Indonesia. And now, the population, the indigenous population of Papua is under 50 percent. LAM: Are there any signs that the Melanesian Spearhead Group is moving on the issue of Papuans joining the grouping? BARBER: Well, certainly the application for membership is under consideration. Indonesia has invited the MSG foreign ministers to West Papua for a visit and of course, they must honour that commitment and ensure that the ministers are allowed and able to visit the province, and to have freedom of movement, when they go there. LAM: What issues would you like the MSG leaders to raise with the Indonesian authorities, when they do visit Papua province? BARBER: The human rights issues, which I've mentioned, including freedom of expression, freedom of peaceful assembly, but I would also hope that the Melanesian Spearhead Group can also become a forum, in which there can be some kind of dialogue, to take place between the West Papuans and Indonesia, which would help to promote a peaceful resolution of the conflict in the territory. LAM: And what's your intelligence telling you about the situation in Papua, where human rights is concerned? BARBER: Well, the situation is not good at the present time. There're constant violations of the right to freedom of expression and peaceful assembly. Earlier this year, in May, the UN Human Rights Commission expressed concern over a crackdown on mass demonstrations in the provinces and called for the Indonesian government to allow for peaceful protests and hold those accountable for violence. We're monitoring quite closely the situation of political prisoners in the territory, those who're in detention, in violation of their rights to freedom of expression, and currently, there're over 53 political prisoners in Papuan jails, so the situation is not good at the present time, no.